Brassard M-E, Puchala R, Sahlu T, Goetsch AL. Determination of the grazing activity energy cost in Boer goat wethers using a portable indirect calorimety method. 93rd ed. Journal of Animal Science. 2015. Tilahun M, Kefelegn K, Abebe G, Goetsch AL. Effects of levels of Boer goats and Dorper sheep on feed intake, digestibility, growth, and slaughter characteristics in the central highlands of Ethiopia. Tropical Animal Health and Production . 2014;(46). Goetsch AL, Gipson TA. 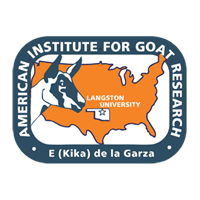 Use of a web-based nutrient requirement calculation system to assess potential influences of various factors on nutrient needs of goats while grazing. Professional Animal Scientist . 2014;(30). Goetsch AL, Detweiler GD, Wang Z, Hayes J, Gipson TA. Supplements of lactating meat goat does grazing grass/forb pastures. Journal of Applied Animal Research. 2014;(42). Tsukahara Y, Gipson TA, Puchala R, Sahlu T, Goetsch AL. Effects of the number of animals per automated feeder and length and time of access on feed intake, growth performance, and behavior of yearling Boer goat wethers. Small Ruminant Research. 2014;(121). Yiakoulaki MD, Goetsch AL, Detweiler GD, Sahlu T. Effects of creep grazing and stocking rate on forage selection and nutritive value of the diet of meat goat does and kids on grass/forb pastures. Small Ruminant Research. 2014;(117). Goetsch AL, Puchala R, Dolebo AT, Gipson TA, Tsukahara Y, Dawson LJ. A simple method to estimate feed required for maintenance of small ruminants. 92nd ed. Journal of Animal Science. 2014. Tsukahara Y, Gipson TA, Hart SP, Dawson LJ, Wang Z, Puchala R, et al.. Effects of breed of hair sheep ram lambs on performance in a centralized test including artificial infection with Haemonchus contortus. 92nd ed. Journal of Animal Science. 2014. Goetsch AL. Handbook for livestock research on smallholder farms in developing countries. 92nd ed. Journal of Animal Science. 2014. Gipson TA, Hart SP, Heinemann R. GIS hot-spot analysis of pasture utilization of two separate herds of goats over time. 92nd ed. Journal of Animal Science. 2014. Pacheco E, Reyes A, Negrón M, Rodriguez A, Gipson TA, Merkel RC. Evaluating the accuracy of using reinforcing bar and an infrared thermometer versus long-stemmed thermometers in monitoring mortality compost pile temperature. 92nd ed. Journal of Animal Science. 2014. Tsukahara Y, Detweiler GD, Gipson TA, Sahlu T, Burke JM, Goetsch AL. Effects of preliminary and washout treatments, experimental design, and meat goat breed in a model to evaluate methods of modifying cattle barb wire fence with electric fence strands for goat containment. Journal of Animal Science. 2013;(91). Merkel RC, Liu CK, Latona N, A. Amma E, Goetsch AL. Effects of level and length of supplementation on leather characteristics of yearling Boer and Spanish wethers. Journal of the American Leather Chemists Association . 2013;(108). Askar AR, Gipson TA, Puchala R, Tesfai K, Detweiler GD, Asmare A, et al.. Effects of stocking rate and physiological state of meat goats grazing grass/forb pastures on forage intake, selection, and digestion, grazing behavior, and performance. Livestock Science . 2013;(154). Hart SP. Effect of a cellulase enzyme additive on hay intake and fiber digestion in goats. 91st ed. Journal of Animal Science. 2013. Mekonnen T, Kefelegn K, Abebe G, Goetsch AL. Effects of levels of Boer goats and Dorper sheep on feed intake, digestibility, growth, and slaughter characteristics in the central highlands of Ethiopia. 91st ed. Journal of Animal Science. 2013. Tsukahara Y, Goetsch AL, Gipson TA, Hayes J, Puchala R, Sahlu T. Effects of adaptation and meat goat breed in a method to evaluate electric fence additions to barb wire fence for goat containment. 91st ed. Journal of Animal Science. 2013. Merkel RC, Gipson TA, Wang Z, Goetsch AL. Effects of level and length of supplementation on carcass amounts and percentages of ash, N, water, total fat, and energy. 91st ed. Journal of Animal Science. 2013. Askar AR, Puchala R, Gipson T, Tesfai K, Detweiler GD, Asmare A, et al.. Effects of stocking rate and physiological state of meat goats grazing grass/forb pastures on forage intake, selection, and digestion, grazing behavior, and performance. 91st ed. Journal of Animal Science. 2013. Tsukahara Y, Goetsch AL, Gipson TA, Hayes J, Puchala R, Sahlu T. Effects of conditions between periods of studies to evaluate electric fence additions to barb wire fence for goat containment. 91st ed. Journal of Animal Science. 2013. Tsukahara Y, Gipson TA, Puchala R, Sahlu T, Goetsch AL. Factors influencing feed intake, growth performance, and behavior by Boer wethers with an automated feeding system. XI International Conference on Goats. 2012. p. 326. Zhong RZ, Wang Z, Zhou DW, Goetsch AL, Sahlu T. Effects of (-) Epigallocatechin-3-gallate (EGCG) on viability of Haemonchus contortus and immunie responses in white blood cells of goats in vitro. XI International Conference on Goats. 2012. p. 362. Merkel R, Liu CK, Latona N, A. A'mma E, Goetsch AL. Effects of level and length of supplementation on leather characteristics of yearling Boer and Spanish wethers. XI International Conference on Goats. 2012. p. 250. Puchala R, Goetsch AL, Manley A, Gipson TA, Sahlu T. Prediction of heat production in Boer goats using heart rate. XI International Conference on Goats. 2012. p. 70.